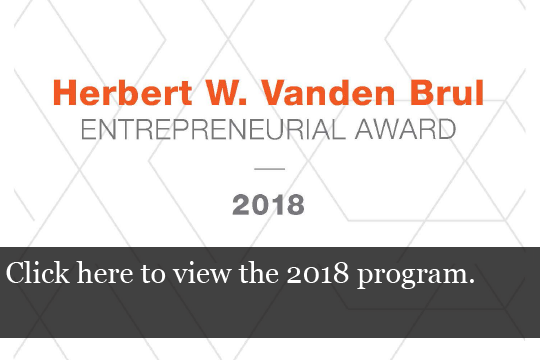 The Herbert W. Vanden Brul Entrepreneurial Award was created in 1984 through an endowment fund established by Mr. Vanden Brul in conjunction with RIT's Saunders College of Business. 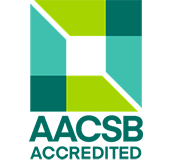 The award is presented annually to an individual or business that has improved the economic life of Greater Rochester or whose innovation management skills have changed the course of an existing business. The award recipient is selected by a committee of area civic and business leaders and RIT faculty. 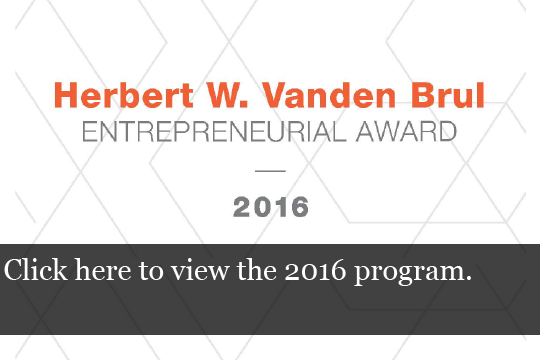 Saunders College is excited that the Herbert W. Vanden Brul Award symbolizes the links that join RIT and the Rochester Business community. Following his military service and earning a juris doctor degree from St. John’s School of Law, Rochester native Herbert W. Vanden Brul returned to his hometown in 1951 to begin his new career practicing law. 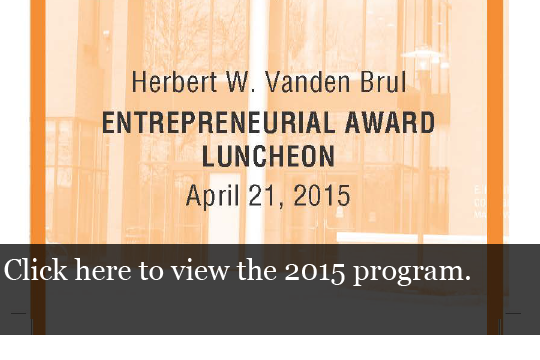 An entrepreneurial visionary in Rochester, Mr. Vanden Brul co-founded several business ventures in the region. One of his most successful, RF Communications, Inc., has since become a division of Harris Corporation. Another, the Culver Management Corporation, acquired nearly one million square feet of local industrial space to become the home of many small start-up companies who have improved the local economic climate. Until his death in 2003, Mr. Vanden Brul continued to pursue his business interests. He served on the boards of Ormec Systems, Inc., and the Genesee Valley Trust Company, Inc., and was active in the cultural and educational life of the Rochester community. 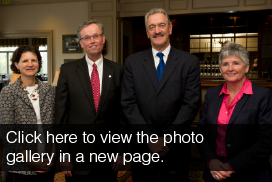 Mr. Vanden Brul and his wife Joan, who passed away in 2007, had a long association with RIT and were active members of the Nathaniel Rochester Society. Their two sons attended RIT. 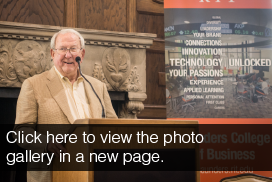 John "Dutch" Summers, CEO of Jasco/Graywood Companies, was named the 2018 Herbert W. Vanden Brul Entrepreneurial Award recipient. Dutch epitomizes the entrepreneurial spirit and commitment to community that built and sustains Greater Rochester. As a young man, Dutch was the third employee in a small tool and die business started by his father. 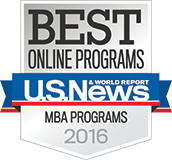 That company over the years grew to include more than 50 businesses in 13 states and 9 countries. He continues to be actively involved in the business, while sharing his financial success, considerable business knowledge, and wide ranging interests with a variety of community and philanthropic projects. Giovanni "John" LiDestri, owner and CEO of LiDestri Food and Drink, was named the 2017 Herbert W. Vanden Brul Entrepreneurial Award recipient. In 2002, John LiDestri bought Cantisano Foods and changed the name to LiDestri Food and Drink. At that point, they were making spaghetti sauce and salsa and he decided to reinvent themselves. Today, they have expanded into the beverage and spirits industry, with brands such as Bai, an antioxidant infusion drink brand. His commitment to LiDestri Food and Drink's employees and the Rochester community, while also delivering high quality products is the reason why he is honored with such an award. 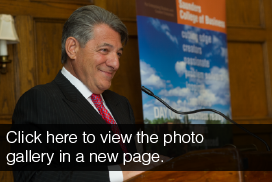 Thomas Bonadio, founder and chief executive of The Bonadio Group, was awarded the 2016 Herbert W. Vanden Brul Entrepreneurial Award. 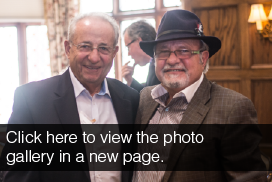 As an active member in the Rochester community and visionary in the accounting industry, Thomas Bonadio encompasses all traits that Herbert W. Vanden Brul set out to recognize. 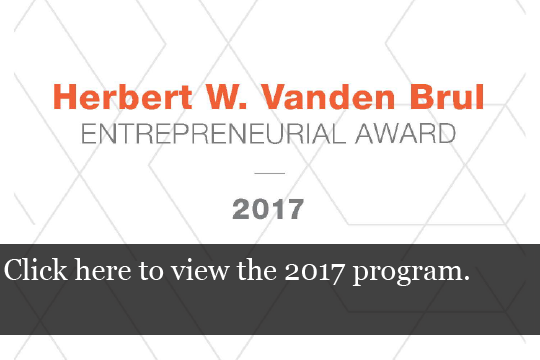 Saunders College is excited that the Herbert W. Vanden Brul Award symbolizes the links that join RIT and the Rochester Business community. The 2015 Vanden Brul Award Honoree was John Smith, Chairman and CEO at Brite Computers. 2012 Ernest Del Monte Del Monte Corp.
2010 Bill Pollock Optimation Technology Inc.
Home Properties of NY, Inc.
1998 Dilip Vellodi The Sutherland Group, LTD.
1995 Valerie Mannix Mercury Print Productions, Inc.
1994 Charles and Burton August Monro Muffler Brake, Inc.
1993 Richard Aab ACC Corp.
1991 Robert Wegman Wegmans Food Markets, Inc.
1990 Klaus and Brigitte Gueldenpfennig Redcom Laboratories Inc.
1987 Tom Golisano Paychex, Inc.
1985 Robert Hurlbut Vari-Care Inc.
1984 Herman Affel, Jr. and Jeffery Tai Computer Consoles Inc.